His name was Sheikh Sharf Uddin and Bu-Ali Shah the title. His father, Sheikh Fakhar Uddin was a great scholar and saint of his time. The mother, Bibi Hafiza Jamal, was the daughter of Maulana Syed Nemat Ullah Hamdani. His father came from Iraq in the year 600 Hijri and settled down in Panipat. His lineage with several links reached Hazrat Imam Abu Hanifa. He was born in 606 Hijri in Panipat. He undertook severe penance and meditation, stood in a state of absorption for several days in water till the fish ate away flesh form his calves. One day he was engaged in meditation, a voice he heard. It said, "Sharf Uddin, we granted you your prayer say, what do you want?" He said, "I need none save you. I will give away my life in love while standing at this place." The voice again descended, "Get out of water, you have to do much for us." He replied, "I will not emerge myself from the river of love. If you want it, then do it." Saying this he was lost again. He witnessed, in the state, that a saint appeared and lifted him out of the river and placed him on the bank. Still some chroniclers say that he did not pledge obedience to a holy man but was admitted directly into the fold by Hazrat Ali. Some link him to the Mahboob-e-Ilahi whereas others bind him to Hazrat Qutub Uddin Bakhtiyar Ka'aki and Sheikh Shabu Uddin Suharawardy. One day a disciple of Shamsuddin Turk went to the city on an errand and saw Boo Ali Shah riding a lion and retold the episode to his teacher. Shamsuddin Turk said to his disciple, "Go to the residence of Boo Ali Shah and if you see him riding the lion, tell him: "The lion should live in the jungle." The disciple obeyed, found Hazrat Boo Ali Shah in the condition and conveyed his teacher's message. He rose from his place immediately and went to Ghote. 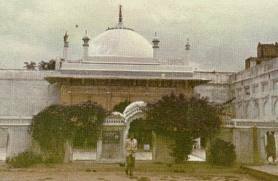 It is mentioned in 'Sair-Ul-Akhtab' that he died on 17, Ramazul Mubarak 724 Hijri at Budha Khera but lay to rest in Panipat instead.